Jacket, aircrew, combat, temperate (DPM), Mk.2/2A. Stores reference 22c/1300567. Size 6 (Ht. 68-72"/172.7-182.8cm, chest greater than 40.5"/102.8cm). 1973 dated. Hip length flying jacket in DPM with chest pockets closed by angled izips, patch pockets on the skirt and full length zip behind a buttoned storm flap. Velcro adjustable cuffs. Also fitted with an integral hood stowed inside the lining behind a zip at the rear of the collar. 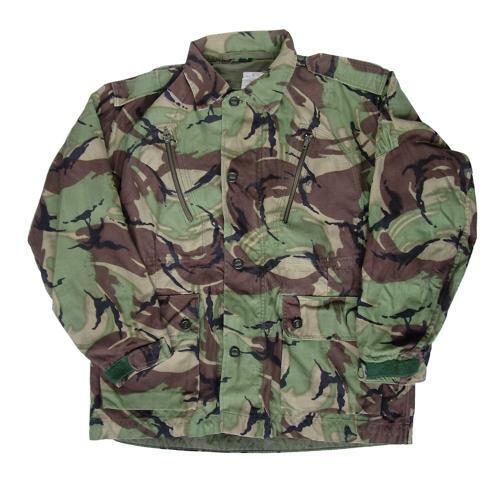 An early example of this popular jacket finished in disruptive pattern material. These were intended for wear over a one-piece flying suit coverall for addiitonal warmth along with matching trousers (also available on the website, stock code S23383). Excellent used condition. A great jacket. Stock code J23382.